Renovating your home is a difficult process if you do not already have experience making home repairs. Choosing between products for your next home improvement project is made easier once you identify the proper use for each item. Homeowners typically have trouble distinguishing between caulk and grout when installing tile. While these items are similar, they are not interchangeable. You may end up with more work if you choose to use grout on a project requiring caulking and vice versa, so learning the difference in advance saves both time and money. Caulk is a waterproof sealant while grout is a paste permeable to water. Depending upon where you are completing your home renovation project, utilizing waterproof materials may be a necessity. There are several variants to each option and choosing the best variation helps to reduce the amount of time you spend completing your task. Provided below is information on the types of grout and caulk available and how to best utilize each. Grout is typically produced as a paste or mortar, meaning it can be penetrated by water unless an additional sealant is applied. If you are installing tile, use grout to work as a bond between each tile to help reduce the amount of movement occurring between the tiles over time. Grout is used for both floor and wall tiles and provides a finished look to your project once it has dried completely. This helps prevent the tile from cracking or chipping, especially in areas of heavy traffic. You cannot apply grout with common household materials, so you must purchase specialty tools. Purchase a grout applicant, typically referred to as a float, as well as a new sponge to remove residue during the application process. With the float, apply the grout directly to the required areas and smooth the product evenly before it sets. Once you have smoothed the grout into the designated area between tiles, dampen the sponge and carefully wipe across the tiles to remove any remaining residue. Backsplashes in the bath and kitchen. Applying a sealant to your tile once the grout has dried allows the area to become waterproof. This step is essential when you are applying grout to areas exposed to water, such as in the bathroom and in the kitchen. There are two primary types of grout to choose from. Your selection is based on the application and location for the grout. Cement-based grout is commonly used when applying tiles with a wider joint, as the sand-like texture of the grout prevents shrinkage from occurring. This type of grout is available with or without sand. When using cement-based grout, you need to mix the powdered material with water before applying the pigments to your tiled area. Sealing cement-based grout is advisable, as it becomes discolored over time due to the porous nature of the material. Epoxy grout is used in areas where you frequently reside, such as the kitchen. When you are installing countertops, kitchen floors or a new backsplash, purchase epoxy grout to help seal the materials together. This type of grout is constructed of a resin and hardener combination, which provides a durable quality to the cement-based alternative. Epoxy grout is more expensive, though it lasts longer and retains stain-resistance qualities without the need of additional sealants. Apply caulk directly to cracks, gaps or breaks in your building materials to create an airtight seal impervious to water. Caulk additionally helps prevent heat loss throughout your home during winter months and provides a layer of pest control as many insects are incapable of penetrating the sealant. The application of this sealant requires the use of a caulk gun, which you can purchase along with squeezable tubes of caulk ahead of your next project. Latex caulk is the easiest to apply and can be painted over once the project is completed. Latex/acrylic caulk is available as well and holds the same properties as the strictly latex version. Apply latex caulk to areas around the interior of your home to add a layer of sealant to heavy-traffic areas. Soap and water can be used to clean any excess, though you must ensure you are wiping the surface down before the material hardens. Silicone caulk is more flexible and durable than other caulk options and is best used for outdoor surfaces. Apply silicone caulk to nonporous surfaces to decrease the expansion between materials over time. Oftentimes, outdoor areas are susceptible to expansion when the hot weather arrives, which can leave a gap between outdoor tiles and other materials. With the application of silicone caulk, this expansion is prevented. You cannot paint over silicone caulk, though this variety is available in a clear option as well as several neutral colors. Acrylic latex silicone blend caulk shares similar properties to the silicone caulk, though this option is easier to apply. Acrylic latex silicone blend retains the same level of durability as silicone caulk and is used for both indoor and outdoor projects. Use this type of caulk to seal windows, doors, brick, stone or siding. Specialty caulk is available for certain applications, including minor roof and driveway repairs. 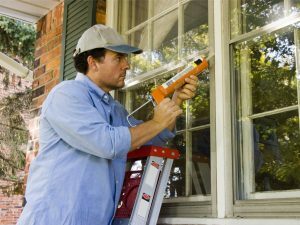 Specialty caulk binds and seals the materials it is applied to and helps prevent mold and mildew from developing. Use this type of caulk for bathrooms and kitchens where moisture is prevalent. Fire-rated caulk is available if you need to seal a fireplace or an area of your home coming into direct contact with the heat.